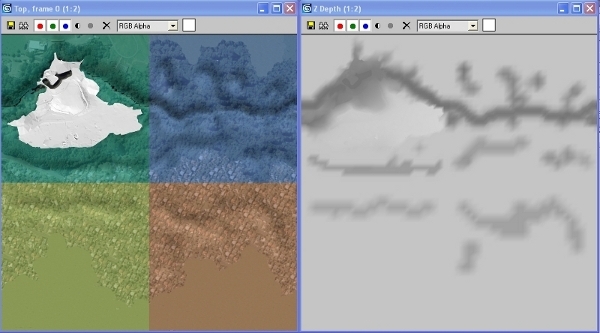 This is an alternative method of creating game terrains using 3DMax meshes rather than the usual depth map painting method. 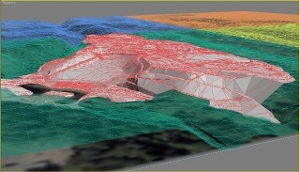 (ironically it does require a depth map but it is produced automatically) As you will see, With the optional extra step 3, real-world survey meshes can be incorperated. These are output from Civil Engineering Design programs such as Bentley MX, AutoCad Civil3D,CivilCad,12d or similar. I'm also going to see if I can plunder Google Earth for some. The use of Aerial photographs and real site sounds can complete the illusion. 2. Arrange them using vertex snaps to form precisely 1024 X 1024. Name them 1,2,3,4 in accordance with the game tiling convention ie 1=top left, 2=bottom left, 3=top right, 4=bottom right. 3. Optional. If you have a real-world survey triangulation, splice it into one of the planes. This can take some time because you need to ensure that there are no 'holes'. Fortunately for me, my example was less than 512 metres long so it fitted in one plane nicely (see pink mesh in screenshot below). Bigger surveys would have to span planes and the repeat pattern would have to be more carefully planned. 4. Clone instances (not copies) of the planes in your planned repeat pattern. Move and position them precisely using vertex snaps. These will help you see what the final tiling will look like. 5. Now the fun bit. For each plane, edit the vertices with soft selection to get some nice hills, valleys and features. Subdivide/Tesselate the mesh if necessary. If you wish, use supplementary plane objects to define level ground or river beds. Any changes will automatically affect related instances so a perfect tile join will be guaranteed. TIP. Avoid too much adjustment in the corners if you can. 6. Delete the instances when you've done, leaving the 4 planes. 7. Set render output to 1024 X 1024 and also set up a Z map output render. 8. Render a blowup of the top view and position the render outline carefully over the 4 planes to ensure that there are no margins, else you'll end up with extra deep trenches at the tile joints. 9. The resulting depthmap image is what you require. (see screenshot below) It may need brightness / contrast adjustment in a paint package before conversion into a .raw file. Check that there are no borders and that the .raw is 1024kb. Refer to it in a .tpj file along with your tile repeat definition. TIP. don't miss out the .trn, the manual doesn't mention it but it's critical. 11. Run dfbhdmed.exe, select your terrain and create a player start point. 12. Strike up the game and enter your world. Trot off and check those tile joint positions. 13. Refine as necessary, then start building your mission. Have you got copies of the pictures? Your reference pics are on your hard drive, we can't see them. If you email them to me, I'll add them in, or, you could use my free host to host the pictures for this post. Click this link for info on pic hosting. Hopefully the uploaded images should now be visible. 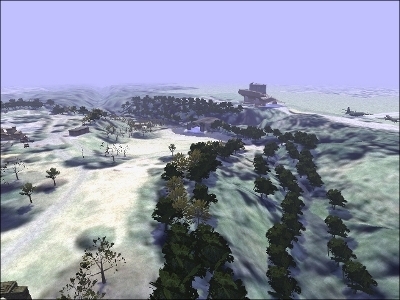 Nice terrain, I may come knocking on your compter for some custom terrains for the reload mod at a later date. DepuT, can you reup the missing pics, I buggered up when I transferred the files back to dfreload. The link above now go to a file uploader here at DFR, rather than DFG.